In Part One a reporter from the Adelaide Register newspaper joined the Australian Aerial Services airmail service between Adelaide and Sydney in June 1925. The service was exactly a year old at the time – having started in June 1924 as the first inter-state airmail service in Australia, the first between major cities, and the first in the relatively populous southeast. 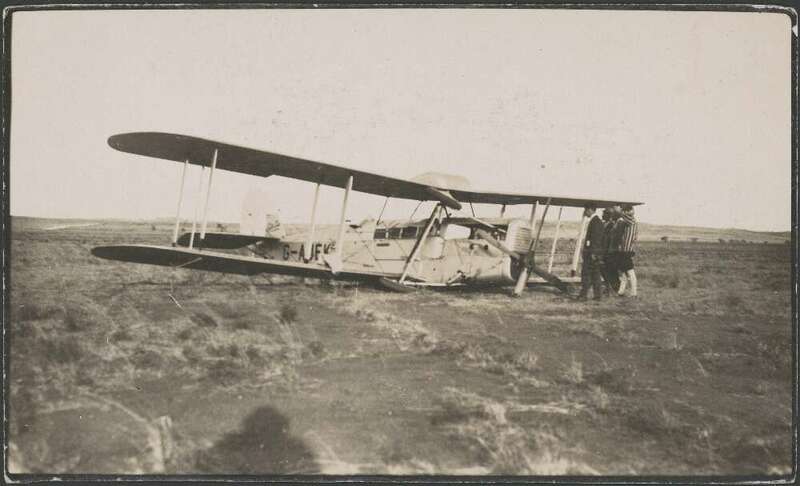 When we finished last time, their de Havilland DH.50 ‘Wattle Bird’ (G-AUEJ) had been delayed by rain at Mildura, and it was 12.30 before pilot, mechanic and passenger were finally able to continue toward their scheduled stop at Hay, in central NSW…. With a view to making better weather, Capt. Sutcliffe sought a greater elevation, but though the wind was stronger the air was less ‘pockety’, and the travelling was more comfortable. With a side wind the ‘plane at times swayed from side to side, in the same way one may notice birds being buffeted by a strong breeze. Water was observable everywhere, indeed the whole country appeared to be inundated, and miniature lakes cold be noticed as far as the eye could see. Although at times we flew low, no birds were encountered, and the only bird life noticeable were flocks of white cockatoos, whose habitat appeared to be in trees by the side of the river. We followed the track of the Murray as far as Euston, which we passed at 5 minutes past 1, and the next town we sighted was Balranald, on the Murrumbidgee. The country was now absolutely flat, and not a tree could be seen anywhere. We sighted numberless dams, which at the height we were flying appeared to be constructed of cement, and every one was full of water. They seemed no bigger than large saucers. As we rose higher the white fleecy clouds which passed us looked exactly like hundreds of pieces of cotton wool floating through the air. We had now entered the famous Riverina belt, which, I was informed, a week or two before was dry and dusty, without a blade of grass for miles. What a wonderful country it is when rain falls! Grass appeared to be springing up everywhere, and the squatters who inhabit this portion of New South Wales are apparently in for a good time. 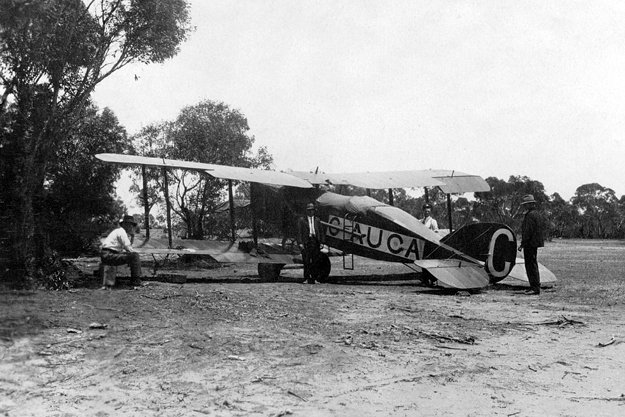 The Australian Aerial Services, Limited, have their workshops at Hay, and employ a skilled staff to keep their aeroplanes in order, overhaul the engines daily, make repairs, etc. Approaching the aerodrome, which is situated on a large common, the pilot was in somewhat of a quandary by finding it under water in places. 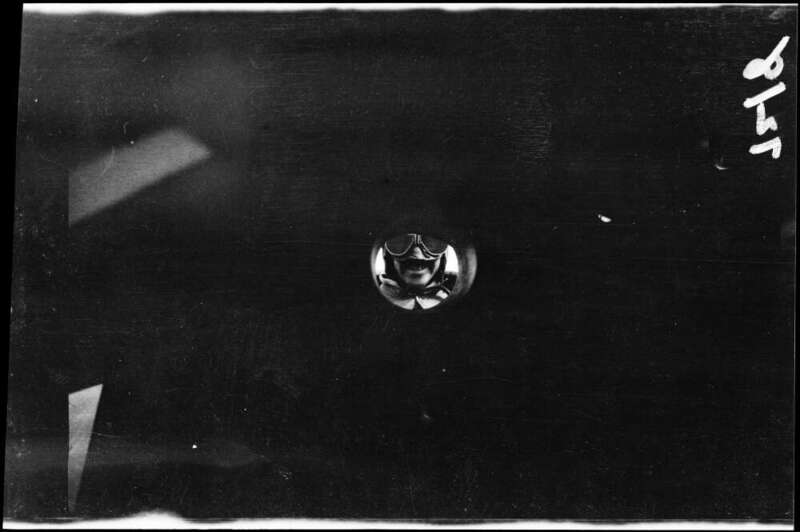 However, as he was thoroughly acquainted with its peculiarities, he circled round two or three times, and eventually made a good landing immediately in front of the hangar. Several of the employees dashed out, kept the ‘plane on the move, and brought it to a stop in a most convenient position for housing it from the weather. In view of the reports received from Cootamundra, it was decided to stay the night at Hay. I had thought the roads around Mildura in a deplorable condition but those in and around Hay can only be described as awful. Hay, I believe, was originally called Lang’s Crossing, and in the good old days was a most prosperous town. Being in the heart of the Riverina district it was the rallying point, so to speak, for the squatters of that valuable portion of New South Wales. Its club was conducted on the most correct English lines, and an old inhabitant informed me, speaking of those happy times, before strikes and labour troubles had devastated the country, that he remembered powdered footmen, French Ladies’ maids, and other evidences of old world refinement gracing the functions of Lang’s Crossing in the heyday of its prosperity. But as a casual visitor I should say ‘the light of other days has faded’. And when I asked the reason I was told it was the motor car. 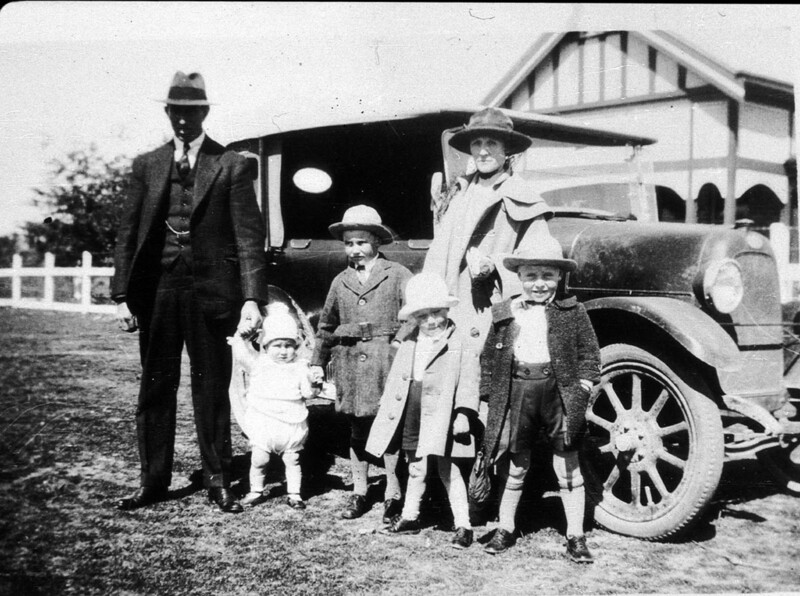 Instead of finding their amusements in what I might term their country town, the squatters and their women folk, jump into their Rolls-Royces, speed away to the nearest railway station, and in the course of a few hours are enjoying their cocktail at Menzies or a perfectly served dinner at the Ambassadors. Hay, I have always been given to understand, in summer is one of the hottest places in Australia; indeed, it used to be a popular saying, west of the Darling, that where heat was concerned there was nothing to compare with ‘Hay, Hell and Booligal’. My experience of Hay, however, was that it was extremely cold, and as it depends for its lighting on a few antiquated gas lamps, a stroll through through its streets at night is not unattended with danger. When I expressed my surprise to an old resident to whom I was introduced at the absence of electric light, and Hay’s unmade streets, he informed me that some time ago the Government offered the town its choice between electric light and an up-to-date sewerage system, and the ratepayers decided in favour of the latter. I should say they were wise in their choice. Now an enterprising capitalist is coming along with an electric lighting scheme, and Hay will then possess two modern essentials. With regard to the absence of macadamized roads the explanation was that there is no stone in or around Hay, and the cost of cartage of good road-making material is prohibitive. Hay, as most Australians are aware, is located on the Murrumbidgee, and it used to be a standing joke in the town to take a newcomer down to the river, where it is not very wide, and wager drinks with him that he could not throw a stone across the stream. He invariably lost as it was impossible to find a stone in the neighbourhood. When the joke spread and new chums turned up with stones concealed in their pockets, the ‘smart Alecs’ of Hay ceased to see any fun in it. It is now only a memory. 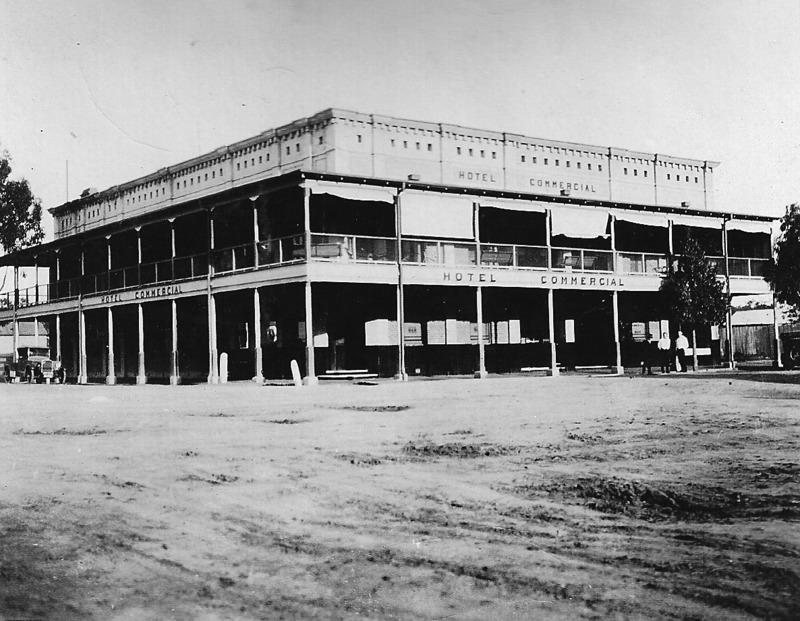 Hay possesses one fine residential hotel, Bryant’s, a reinforced concrete structure, designed on modern lines, and possessing its own electric light plant. It is most comfortable. But as Hay has been selected as the central station for Australian Aerial Services it is certain to become prominent once more. Capt. 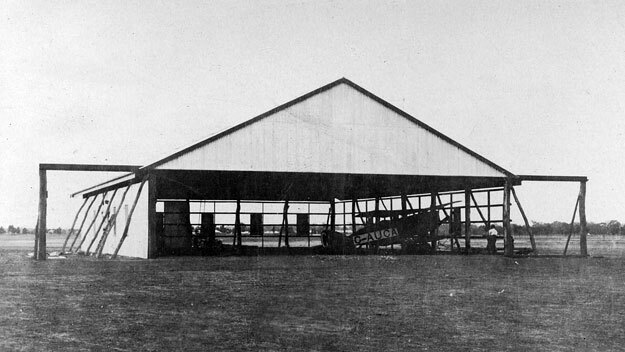 Sutcliffe left the aeroplane at Hay, and Capt. Briggs took charge on the trip from Hay to Sydney. Capt. Briggs requires no introduction to South Australian readers. His ability as a pilot is known throughout the Commonwealth, and his long residence in Adelaide has caused him to be looked upon as the central State’s very own. As the weather looked threatening he decided to make an early start, and we went aloft at 7.20 a.m.
We had an additional passenger on this occasion in the person of Capt. Newnham, who is about to become a pilot on the Hay to Sydney run, and who for some time has been doing similar work on the service that is being carried on do successfully between Perth and the far northwestern towns of Western Australia. Before taking up a particular route a pilot makes the trip several times with another pilot who is thoroughly familiar with it. He rides in the cabin, has a map prepared by the Commonwealth Air Department, which shows every point of interest in detail, in front of him, and also has the advantage of gleaning first-hand information from the mechanic, who is au fait with all matters connected with the route. Capt. 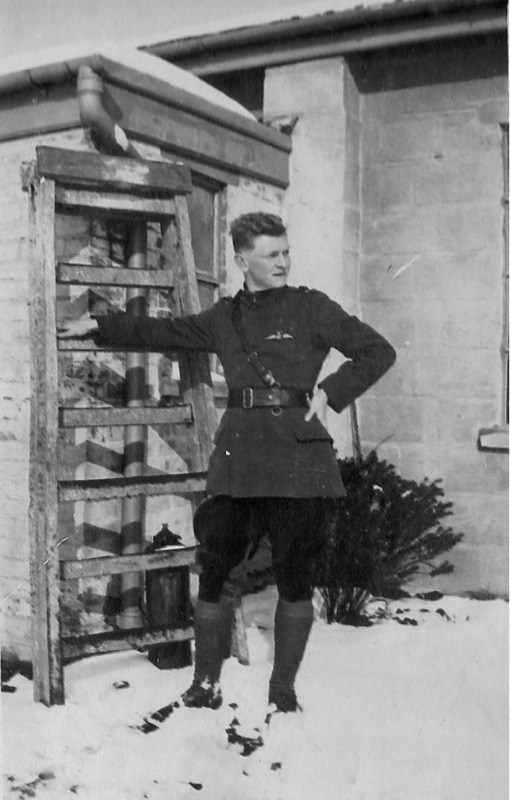 Newnham is, as, indeed, are all the airmen I have met, a most interesting personage, and entertained me with many stories of his career. He was for some time engaged as a pilot on the London-Paris and London-Cologne routes prior to coming to Australia, and I realised when talking to him how great is the responsibility of the men who take charge of aerial expresses in the northern latitudes. The Western Australian climate he considered ideal for flying, and the safety with which its aerial services have so far been conducted have made them increasingly popular. The company controlling them is on a paying basis, and is likely to be more so. They have an advantage in that their principal competitors are the steamers. The latter take about three weeks to accomplish a journey that the ‘planes cover in three days. Capt. Newnham’s presence made my trip to Sydney additionally attractive, as he pointed out all the emergency landing places and various other interesting features that figured on his map. 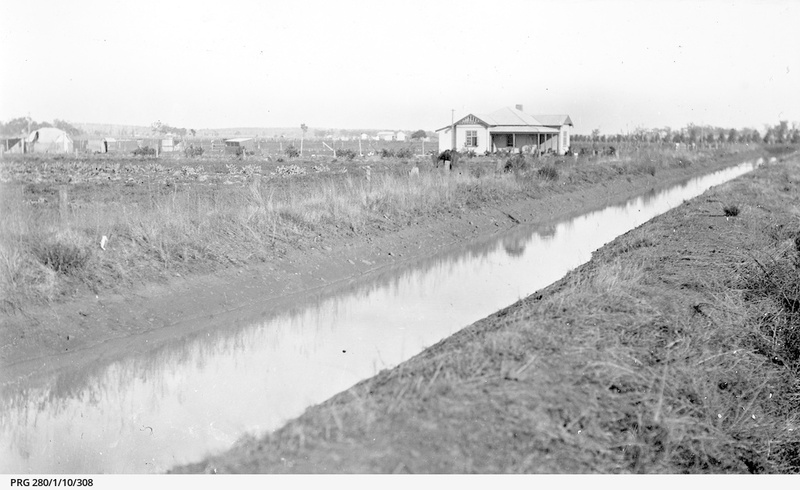 As far as Narrandera we practically followed the Murrumbidgee and the railway line, and I was impressed with the enormous extent of cultivated land, and the huge irrigation schemes that are being carried out. The country looked magnificent, and after the phenomenal rainfall which has fallen in various areas along the Murrumbidgee the land should blossom like the rose. We were able to form an excellent idea of the famous Yanco irrigation scheme, and had a splendid view of Leeton, another extensive irrigation settlement, near Narrandera. The landing place at the latter town is on the racecourse, but we were advised before leaving Hay that most of it was underwater. Flying low we discerned a motor car waiting for the mails on a dry spot, so Capt. Briggs dropped the bags, and we continued on our way. It was, in the opinion of Capt. Newnham, a typical English day, cold, bleak, and wet, and I did not envy the pilot his job. His face is protected from the wind by a triangular piece of glass, but when he runs into a rainstorm he is obliged to throw back his goggles, and, of course, raise his face above the protecting glass as otherwise his vision would be obscured by the water running down it. The result is that when the ‘plane is rushing through the air at anything from 80 to 100 miles an hour the rain acts on his face like so much whipcord. The higher you go the less speed you appear to be travelling at, but one could form a good idea of the rate at which we were cleaving the air by watching trains proceeding in the same direction. Trains looked about the size of a lead pencil, and the steam exuding from them about the volume that usually escapes from a small kettle. But through they were probably travelling at 30 or 35 miles an hour, in a few minutes we lost sight of them. Our first stop was to be Cootamundra, 200 miles from Hay by air, and as we neared this important junction, which by the way is equidistant from Sydney and Melbourne, all the creeks and rivers were seen to be in flood. 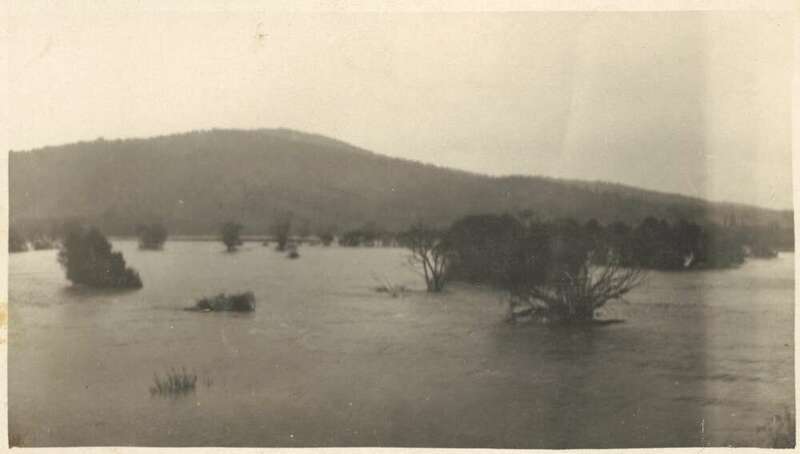 We were to learn afterwards that the floods in some centres were the highest and most disastrous since the foundation of New South Wales. We reached ‘Coota’, as it is locally called, at 9.45 a.m. and Capt. Briggs made a brilliant landing at the local ‘drome, which we were glad to find was comparatively dry. We handed over the mails, took on the Sydney bags, had a cup of hot coffee which, like a well-advertised cocoa, proved ‘grateful and comforting’ , climbed into our seats again, and, in view of the weather, prepared for what was likely to provide the worst portion of the journey – the trip over the Great Dividing Range. We shaped what was practically a straight line for Mittagong, flying over Harden, Gunning, Yass and Goulburn en route, and following the Sydney-Melbourne railway line at frequent intervals. The weather in the lower levels might truly be described as vile, The visibility was bad, the rain constant, the clouds thick and murky, and the conditions altogether most unpleasant. It was then one appreciated the coziness of the cabin, and realised what a good pilot means on an aeroplane trip, and how essential it is that he posses a complete knowledge of the route. For having once familiarised himself with it per medium of the map he trusts in future to his memory. It is all important that he possess the bump of locativeness in a marked degree, and it is remarkable how quickly a pilot can recall in his recollection a landmark that he has once seen. 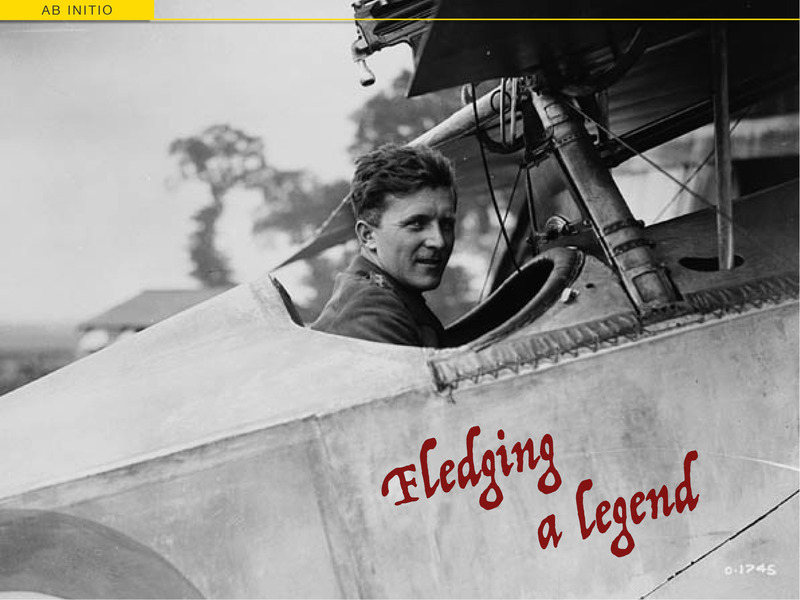 Pilot Briggs possesses this qualification to a surprising extent and never appears to hesitate as to the best course to pursue. Approaching that part of the mountains known, I believe, as the Cullinan Range, we flew rather low, with the result that we obtained an exceptionally fine view of many flooded areas, and were able to form an adequate idea of the tremendous rush of water from the hilly country that was the cause of all the damage. I never realised before in an adequate degree the wonderful force the mountains are in the matter of feeding the rivers. The way the rain beats down on the mountains suggested the emptying of thousands of buckets of water on a vast inclined space. Every ledge of rock seemed to be dripping water, which, rolling into the valleys below, formed huge streams, ever increasing in volume and strength, and carrying destruction on their way to the sea. We sighted dozens of homesteads, looking like miniature islands in a sea of swirling waters. We only saw them for a minute and could only conjecture as to their fate. But when I read the next day of the fearful damage wrought by the floods in the area over which we passed, no one realised more than I what pygmies we are when opposed to the forces of Nature, and how absolutely impotent man is in the face of such stupendous torrents as bare their being in mountainous regions like the Great Dividing Range. Tiring of the unpleasant conditions, Capt. Briggs turned the nose of the machine upwards and rose above the low-lying clouds. As we emerged from the thick, murky bank we were met with a magnificent sight. As far as the eye could see the Great Dividing Range was covered with white, fleecy clouds , giving it the appearance of a ridge of snow-capped mountains. The sun, shining on them in places, provided a scene that was indescribably beautiful, and I should imagine it would be on all fours with the sight the Himalayas would present if viewed from the air. Travelling was easier and the weather conditions immeasurably improved. The danger in rising above the lower bank of clouds seemed to me to centre in the task of finding one’s way back to earth again, and the pilot, who has probably steered by the compass with which he is provided, has to keep a sharp lookout for a rift in order to ascertain his position, otherwise he might bump into an invisible mountain top. I have never heard of such an accident, and with ‘Safety first’ for the motto one is unlikely to occur. Anyhow, Capt. Briggs apparently sighted an opening, for we took a downward course, and before long had left the mountains behind us. Between the Great Dividing Range and the Sydney area are miles of what look like low-lying hills, covered with scrub, and as we passed over them they appeared for all the world like the huge dark blue waves one sometimes meets with in tropical latitudes. We were nearing the end of our journey, and both Capt. Newnham and myself eagerly awaited the view of Sydney from the air, for the sky was blue and the visibility excellent. Australians may know this history, but it is great you put it on-line for the rest of us. Incredibly detailed telling of an account from not so long ago, but in aviation terms seems worlds apart from today. A great insight into the towns along the way. Bring on part 3 please. Working on it… 🙂 Despite being less than a century ago, we really are talking about multiple generations in aviation terms. And I guess we’ll look even more ancient to people 90 years from now. Maybe we should cherish our tube-and-wing airliners and 20-hour long haul legs a little more than we do! This is getting better and better! Love the old photos of the towns en route. Amazing to see the sort of crossover effect of the 20th Century seemingly meeting the late 19th Century in some of the places! You can see just how pioneering this trip was for those who undertook it. Some of those towns are really a long way from anywhere. Telegraph, railways kept them in touch, but returning soldiers really brought the 20th century home with them. You’re right, it’s a fascinating period of flux to be looking back into, and the distances that could be covered by air throw the changes into even greater relief. 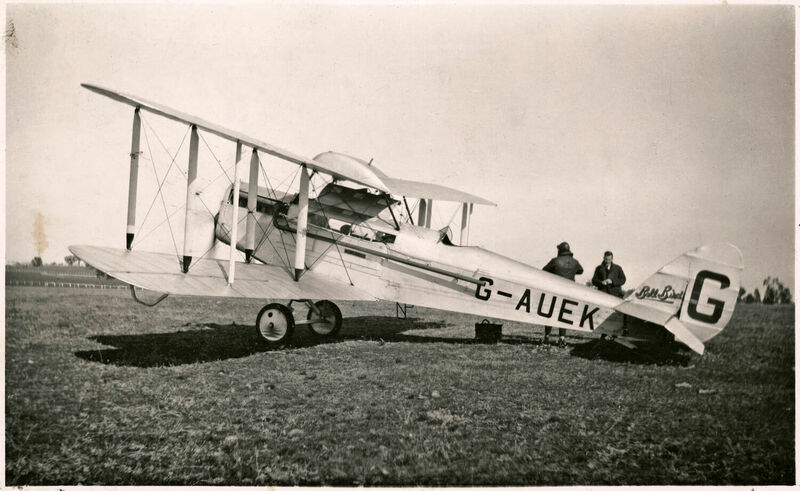 It’s great to read about these pioneering days and the adventures of those early long distance Flyers!